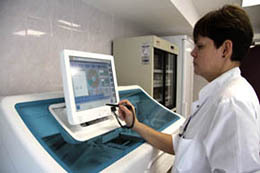 The Laboratory is fitted with state-of-the-art equipment of the world's leading manufacturers. 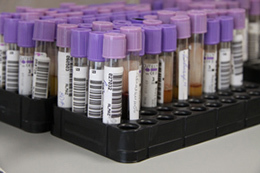 The use of automated analyzers ABBOTT, Roсhe, Beckman Coulter, Radiometer, Becton Dickinson and original reagents ensures the highest level of performance for the best possible results. All automated and semi-automated analyzers are integrated into a single system LabTrak for stringent control at all stages of the testing process. 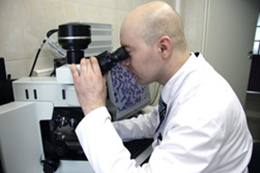 The Laboratory has multilevel quality control to ensure error-free results. Patients can rest assured knowing that their samples are analyzed in a thoroughly-monitored and highly-controlled environment that adheres to the quality standards approved by the Federal Service of External Quality Assessment as satisfactory for purposes of diagnostic testing. Our highly-skilled specialists have extensive experience to provide rapid, accurate, and reliable results that are used by clinicians for the correct diagnosis and treatment of patients. All laboratory processes are fully automated, including pre-analytic processes of marking and handling. For most laboratory tests time to result is generally within one working day. The Laboratory is constantly introducing new lab tests and implementing new methods and at present is one of only a few specialized labs in the country with this testing capability. The single electronic database provides immediate access to all patient's test results during preventive medical checkups or during follow-up in patients with chronic conditions as well as for self-checks by the patient. The Laboratory provides a wide range of test panels based on the advanced methods and relevant international standards and complies with the Randox International Quality Assessment Scheme (RIQAS).